It is colder in Culver City than Hollywood, and less sunny, generally. I take the bus and the train in the mornings, and as I travel, I feel the degrees falling away, see the fog hanging down. Downtown Culver City bustles with pedestrians. People walking from work to lunch, people eating healthy lunches at sidewalk cafes, moms walking their pre-school aged children or their dogs. (There’s one mom who walks around with her three year old girl who always carries a flower in each hand and does princess dances all down the street.) It feels like a city, albeit a very small and quaint one, with groomed landscaping and social flow – like The Truman Show’s Seahaven or Back to the Future’s Hill Valley. 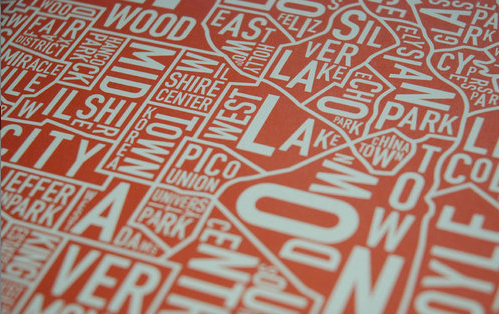 Los Angeles is a city of neighborhoods. Some call them pockets. Each little pocket has a strip. A strip is made up of five to seven shops, one or two bars, a restaurant and/or a cafe. When people ask, “Do you know Los Feliz?”, they’re usually referring to the two-block strip of Vermont Avenue. Downtown Culver City has one major strip, and two off-shoot strips. There might be five cool restaurants in the area, and several good lunch spots. It also has two performing arts theatres, one movie theatre, an In’n’out, a Trader Joes, an Office Max, a Ross Dress for Less, some nail salons, and two studio lots. It’s only a city due to population, and through-traffic (all that east side to west side or vice-versa traffic that is either going to or trying to avoid the freeways). Otherwise, it more accurately resembles a large town. This is Los Angeles, a collection of towns called cities that collectively make up one giant metropolis, if a metropolis can refer to something sprawling and incomprehensible. Greetings from LA. We’re on our way.